Organizations around the world are facing ongoing problems that require immediate attention and action from within. The fast technological advances and paradigm shifts, expansive competition and unstable markets combined with accelerated demographic movements and a volatile global economy have created a world that has become more competitive and stressful than ever before. And be assured, in the background stress is taking its toll on you and the people around. Factors such as inefficient leadership, poor communication, multitasking, rapid changes in direction and governance, confusion between management and leadership in an unstable global economy amplify the negative effects of stress on health, performance, efficiency and overall wellbeing. Such factors ultimately poison customer relationships and can lead to severe financial and technological losses. You and your team members deserve a better future. Our Human Factors Team Performance Program is a leadership, team development and risk mitigation solution that guarantees – with real benchmark and a track record of 2000+ global teams, including the International Space Station, the Space Shuttle Program, the $1 Billion JUNO Project, BOEING, Lockheed Martin – to change the social context of your team and set it for success. Regardless of the nature of the team, whether operational, project or functional, a team development assessment (TDA) provides powerful insights into the behavioral norms with specific actions to drive required behavioral change. A TDA highlights the context in which the team is performing, and is used as the basis for team members to understand, take ownership and be responsible for improving team security and performance. The workshop is the time to focus the attention and solve the most important issues discovered by using the TDAs. These workshops are done exclusively with teams of people who work together. 3. Discover what key behaviors they need to develop as leaders and why failure to do so will lead to project failures. Technical minds work best through examples, hands-on work and experience. For this reason, during workshops we analyze some of the most important failures in history, decode the failure event chain of how these failures occurred, discuss cases from our clients’ past or present and solve current difficulties using our instruments. Regardless if you know the theory or not, nothing happens until you take action and change the behaviours of your team. We schedule a follow up assessment to make sure your team stays on track, to measure the growth in your performance and observe the positive results you get in your team. As institutions become more complex and global, there is increasing need to understand the human dynamic of social context. This is a timely book, an essential read. I was seduced by Dragos's ability to go to the point and lead some of the activities of our program. He is an exceptionally creative and forward thinking fellow who knows how to foster cooperation in a group and produce excellent results. He is an absolute professional it is a joy to work with him. 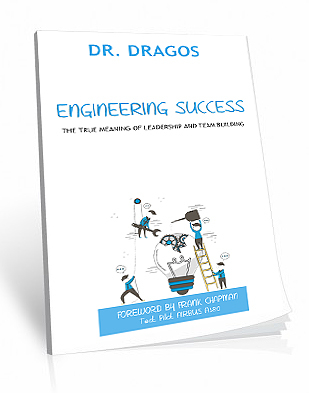 Dragos reveals innovative, sometimes magical solutions to challenges. He deeply understands the forces that drive the success of a team, appreciates the value of team members, and fosters energizing collaborations. The breath of his accomplishment is awesome! I was inspired by Dragos's drive and work ethic. He is also a great team player and knows how to bring people from various backgrounds and cultures to the same page when working on a project. It was a pleasure to work with him. The best resource for any leader and any team member. If you are interested in bringing our program to your company or team, drop us an email at: corporate@drdragos.com or fill out the form here and we will get back with all the details you need.